Crispy Chicken, Bacon and Pesto Gnocchi Skillet is a 20 minute gluten-free dinner recipe that’s simple and satisfying. 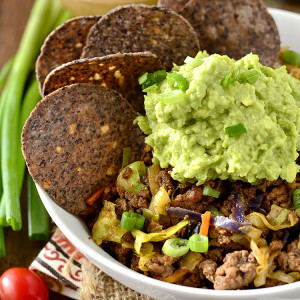 Made with just 5 ingredients and in 1 skillet! I’m about to blow your dang mind with the recipe for Crispy Chicken, Bacon and Pesto Gnocchi Skillet! By the way, I’d really hoped the pesto in this recipe would give the overall dish a festive green hue, thus making it extremely suitable for your St. Patrick’s Day festivities, but it didn’t. The end. Speaking of St. Patrick’s Day, I was reminiscing about my SPDs of yesteryear, when my girlfriends and I would convene in Chicago for a day of things crazy 25 year olds do on holidays that Chicago specializes in, and good grief they were fun! Now I’m old, use phrases like good grief, and the thought of hanging out in a bar with a green beer and bagpipes blasting in my ears at 10am on a Saturday morning make me want to, well, not. Anyway, let’s talk 20 minute, 1 skillet gluten-free dinner recipes that you are going to INHALE. As I mentioned at the end of this post, recipes are not going ANYWHERE, rather, I’m excited to start working lifestyle posts into the mix here on IGE. Anyway, I could never in good conscience keep delectable dishes like this one away from you! This dish could not be simpler and oh.my.word. it is such a keeper. 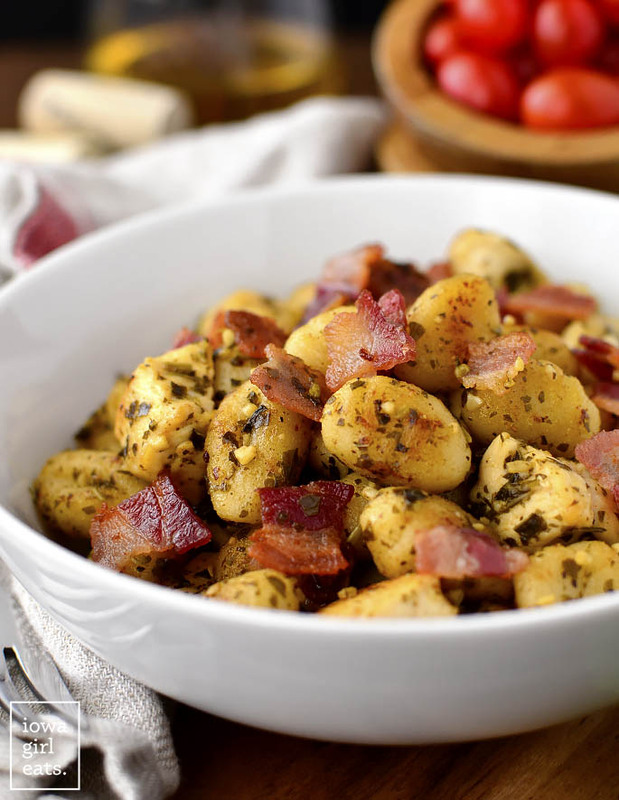 Packaged gnocchi is sizzled in a mixture of olive oil and bacon drippings until tender on the inside and crispy on the outside, then tossed with fresh pesto, cooked bacon, and chicken. 5 ingredients, easy as that, and yes, just as good as it sounds! You may have seen crispy gnocchi recipes that require you to boil gnocchi before pan-frying, but it’s completely unnecessary. True, it will feel all kinds of wrong pouring dry, slightly hard gnocchi into a skillet but I promise that in 5-6 minutes the gnocchi will totally transform. Honestly I could forgo the bacon, chicken, and pesto portion of this recipe and eat an entire pan of crispy gnocchi with a little salt all on its own. Maybe a fried egg on top? HOLD ME. That is to say, once you try pan-fried crispy gnocchi, you will never go back. Feel free to add vegetables to this skillet dinner if you please – halved cherry tomatoes added at the end to warm through would be tasty, while Ben thought chopped, blanched asparagus would be nice too – though we both agreed this dish was 5 stars all on its own. Serve with a side salad (or that egg!) and you’re set. 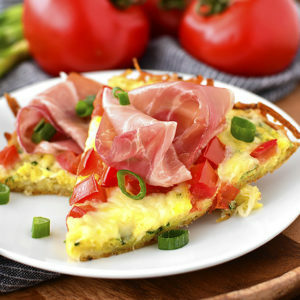 Start by adding 4 slices bacon that have been chopped to a cold, 12″ nonstick skillet then place the skillet over medium heat and cook until browned. Scoop the bacon into a bowl, reserving the fat in the skillet. Tip: I prefer nonstick vs cast iron for this recipe so the gnocchi won’t stick. Turn the heat up slightly then add 2 chicken breasts that have been cut into hunks and seasoned with homemade seasoned salt and pepper then saute until cooked through. Scoop into another bowl then set aside. Add enough extra virgin olive oil into the skillet to equal 2 Tablespoons fat total, then add a 12oz package gluten-free gnocchi and arrange into an even layer in the bottom. 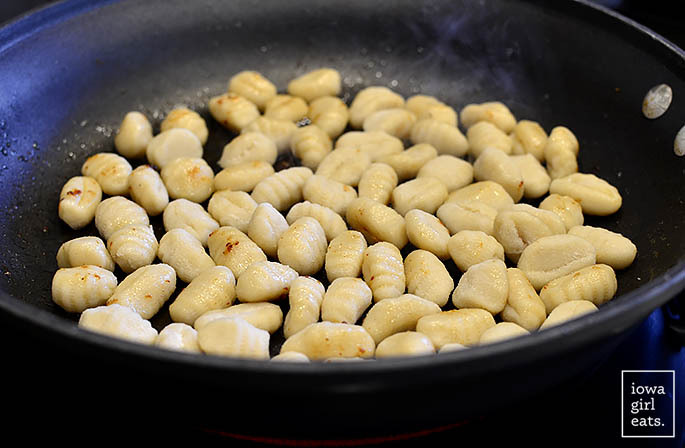 At this point you will be CERTAIN that I am nuts and there’s no way these dry, hard gnocchi will morph into yummy, crispy, perfectly cooked gnocchi – but just you wait! Let the gnocchi sizzle until the bottoms are golden brown, 2-3 minutes, then stir and continue to saute until the gnocchi are tender and golden brown all over, 2-3 more minutes. Use a fork to pierce a gnocchi to test for doneness. You’re going to be SHOCKED! 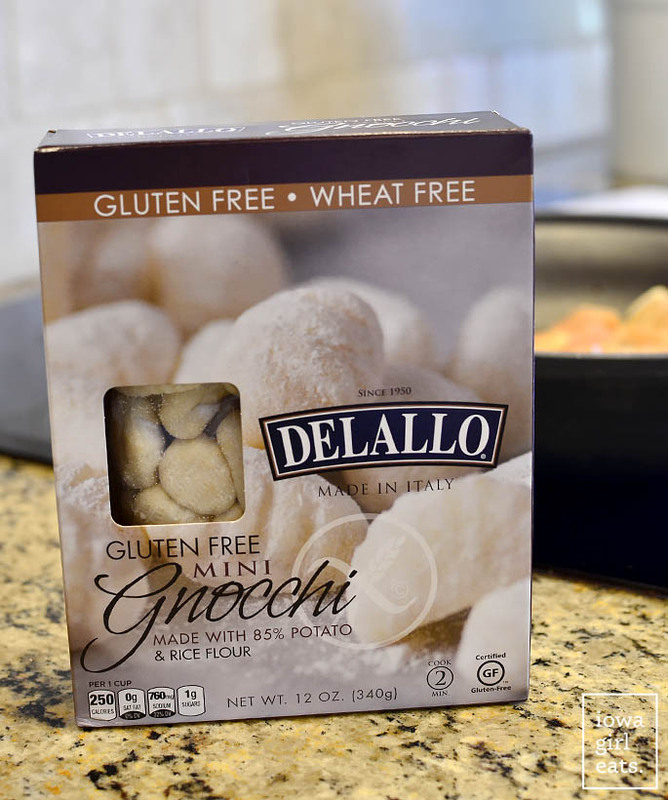 Just a note, I have only tested this recipe using Delallo Gluten-Free Gnocchi (found in HyVee’s Health Market.) That said, I’ve made crispy gnocchi skillets in the past before going gluten-free with several different brands that all worked fine. Last step is to add 1/4 cup prepared pesto, plus the cooked chicken and bacon, then stir until everything is heated through. Note: I’m including a small batch basil pesto recipe in the recipe card below, which makes about 1/3 cup pesto (use the extra Tablespoon to stir into soups, salad dressings, etc) or you can use your favorite jarred pesto. I tested this recipe once using Classico pesto and much preferred homemade. Use what’s best and most convenient for you though. 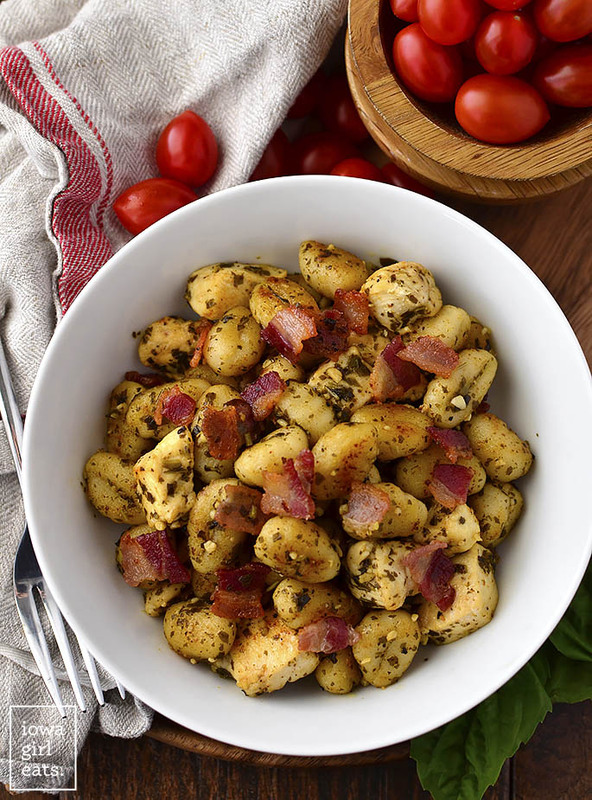 Scoop the Crispy Chicken, Bacon and Pesto Gnocchi Skillet into bowls then dig in! Like I said, you could add any kind of sauteed or roasted vegetable into the mix, but this dish is 100% devourable all on its own. Enjoy, enjoy! 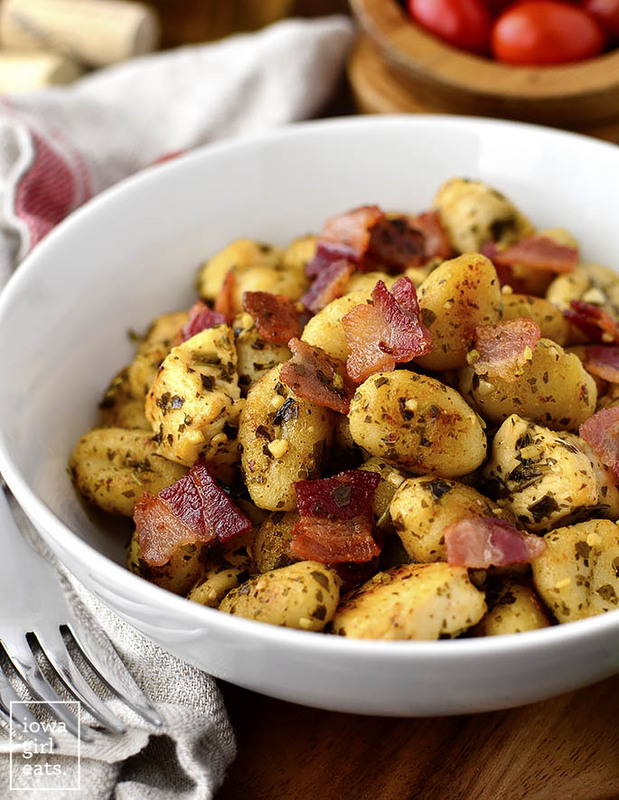 Crispy Chicken, Bacon and Pesto Gnocchi Skillet is a 20 minute gluten-free dinner recipe that's simple and satisfying. Made with just 5 ingredients and in 1 skillet, too! If making homemade Small Batch Pesto: Add basil, walnuts, parmesan cheese, garlic, and salt to a food processor then pulse until the ingredients are finely chopped. Very slowly stream in extra virgin olive oil while the food processor is running until pesto is smooth. Add a little bit of lemon juice at a time until desired taste is reached - the pesto shouldn't taste lemony, just fresh. Set aside. Add bacon to a cold, 12" nonstick skillet then place over medium heat. 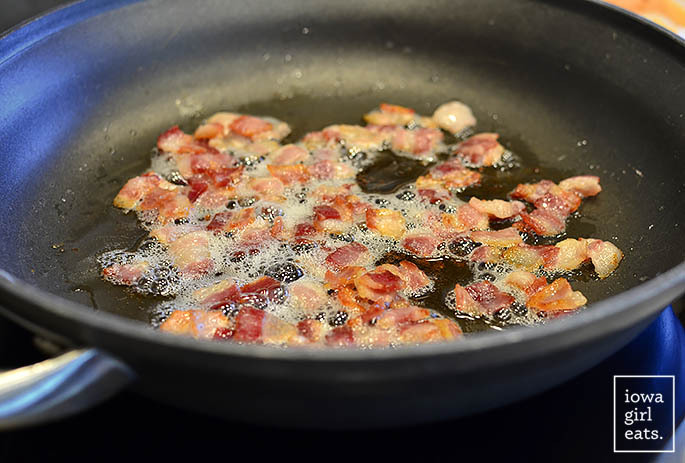 Cook until bacon is browned then scoop into a bowl and set aside, reserving bacon fat in skillet. Turn heat up slightly. 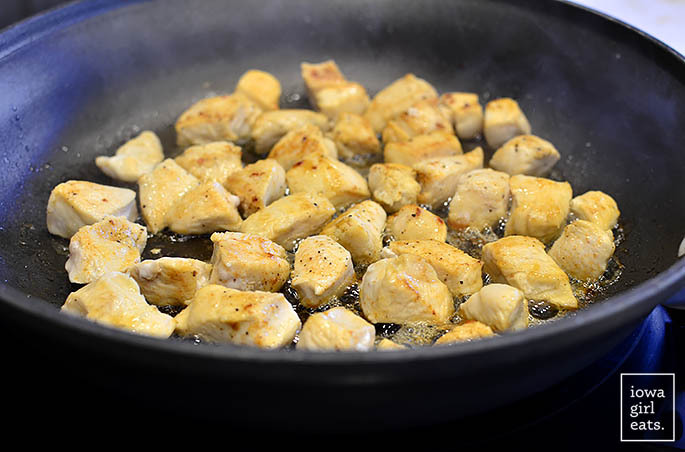 Season chicken with seasoned salt and pepper then add to the skillet and cook until chicken is no longer pink in the center. Scoop into a bowl then set aside. Add enough extra virgin olive oil to the skillet to equal 2 Tablespoons fat total then add gnocchi and arrange into a single layer. Saute until the bottoms are golden brown and crispy, 2-3 minutes, then stir and continue to saute until the gnocchi are tender and golden brown all over, 2-3 additional minutes. Turn heat down to medium-low then add pesto, chicken, and bacon into the skillet. Stir to combine and heat ingredients through then scoop into bowls and serve. Hope you love it, Rhonda! Looks so good, especially with the homemade pesto sauce. Can’t wait to make it for my family. I need to buy a food processor. Do you have a suggestion? in my opinion, green dinners are only appealing one day a year…so i would much rather this look appetizing everyday and be a little less st. pattys day ;) sounds amazing!! One skillet recipes are THE best!! This looks absolutely amazing. I wish I could smell it through the pictures! ha! I wish you could too! 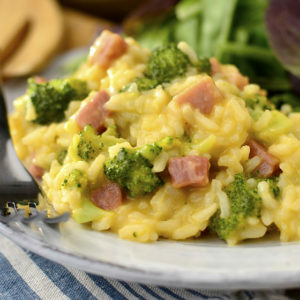 The scent of this dish cooking will bring everyone to the kitchen without having to call, that’s for sure! I’ve been making a crispy gnocchi with pesto, tomatoes and chèvre for years that is delish. Don’t know where I found it – it’s so easy I don’t need the recipe. The addition of bacon sounds fabulous!! I made this last night and it was amazing! Everyone loved it. Thanks! I’m so glad to hear it, Beth! 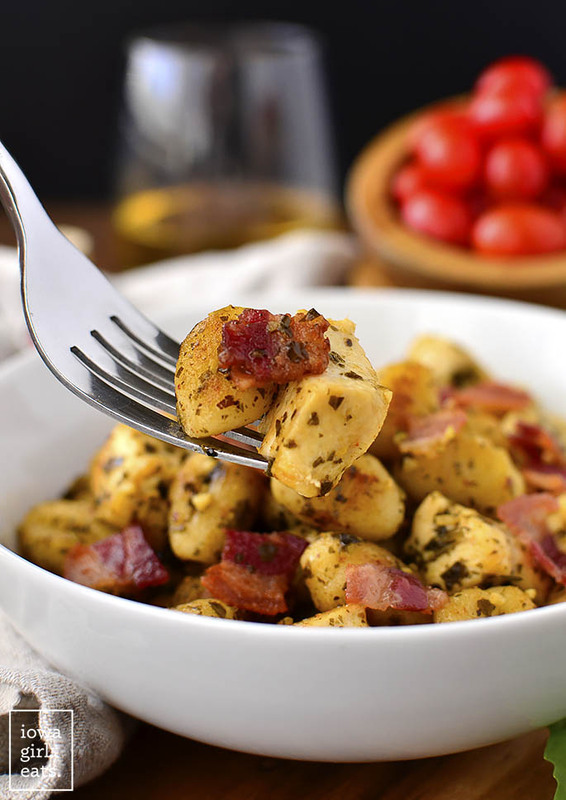 I’m trying out a breakfast-themed crispy gnocchi dish tonight – I’ll post it if it turns out. Thanks so much for your feedback and rating! I couldn’t find dry gnocchi will fresh work the same? It’s kind of weird because “dry” gnocchi are still what I’d consider “fresh” – meaning they’re not hard like dried pasta. What brand did you get? I’ll take a look online and let you know what I think! I made this tonight for my family. A big hit!!! Our teenage son especially loved it! I think this might be the first time I’ve had gnocchi (certainly the first time I’ve ever made it at home), and it was delicious. 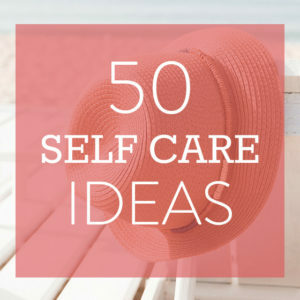 This will be added to our list of favorites! Thanks for another great recipe! So glad to hear it, Kristine! Thank you so much for your feedback! Made this tonight. I told my husband when you posted it last week that you spoke my love language. This lived up to my hopes. And my 2 year old had 2 servings too. Win! Awesome!! This was a hit with my kids too – such a relief! This was a hit – really yummy! 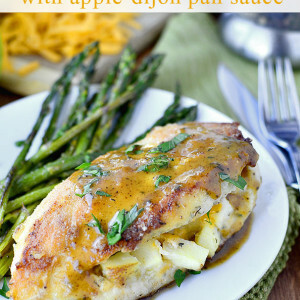 My husband requested this recipe be kept and starred for frequent repeats :) Thank you! Perfection! So glad to hear it, Catherine! This was a quick and easy meal using all ingredients I had on hand. I love my freezer stash of pesto from my potted basil last summer! I served it with a side of asparagus. This made enough food for me + 2 boys (11 & 15) with no leftovers. That’s what I need to do this summer with my basil bounty – great idea! I’m so glad to hear it, Lauren!! Thank you so much for your feedback! Made this this week and it was amazing. I roasted some Brussels sprouts to have on the side but ended just just throwing them in the pan too. Big thumbs up! So yummy, thank you. Added some broccoli and it worked out great! Hello. Do you have a non stick pan that you would recommend? I need one but do not want to buy one that has all the icky chemicals on the nonstick surface! Do they make healthy pans? I’ve been eyeing this since you posted it and finally made it last night and it was SO GOOD. I added some spinach in at the end since we had some that needed to be used and liked the addition. Great easy dinner. Love the spinach addition, Leigh Anne! So glad you loved the dish! Iowa Girl? This is AWESOME. This had great flavor and was so easy to make. I recently went to a cooking class in Des Moines East Village and learned to make gnocchi so eventually I’ll swap out the store bought for homemade. Delicious! Thanks for a great recipe. I’m so glad to hear it, Jackie! The cooking class sounds fun, too! I made this for my family this weekend and it was amazing! I added halved cherry tomatoes right at the end. So good! I made this for my family tonight. Needed something quick, filling and delicious and this fit the bill perfectly! OMG this was so good! And so easy! I agree with many other commenters – I will never boil gnocchi again. This method is sooo much better! Thanks so much! This meal is fantastic!! Making it for the second time tonight. We are going to try adding the tomatoes at the end. Can’t wait!! So glad to hear it, Stacey! Thank you so much for your feedback and recipe rating! I’ve made this recipe twice this summer! Added halved grape tomatoes last time and broccoli on the side tonight. LOVE it! Made this tonight and as usual it did not disappoint!! The noquis were divine in particular, and I was surprised when my son asked for more–a rare occurrence at dinner. It has made it to our “make again” list. 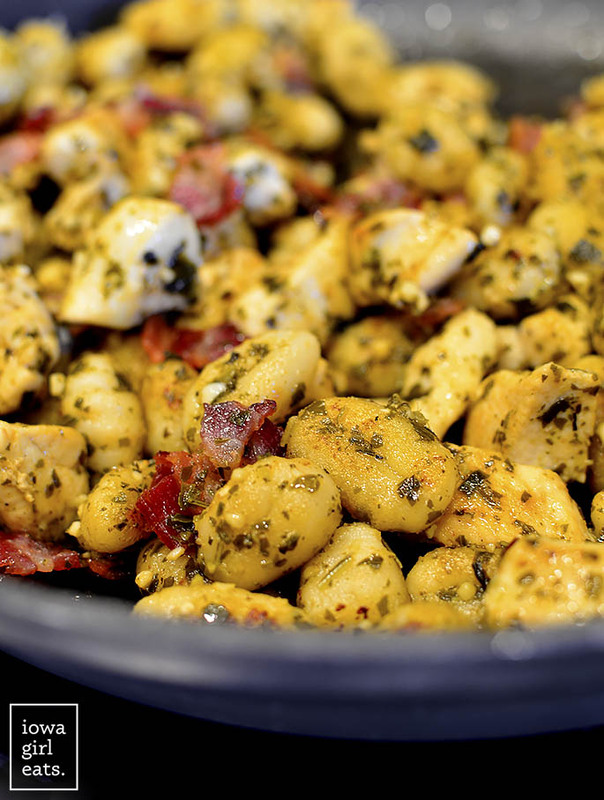 My Husband asked……”what are these little crunchy things they are so good” talking about the gnocchi of course. Enough said it was delicious and he was happy!! Thank you for the recipe! I’m having a hard time finding this gnocchi. Can you help me? I looked at the Waukee HyVee and they didn’t have it. This recipe rocked my world. 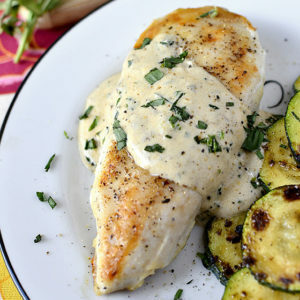 We are new to gluten free eating and I was amazed at how easy this dish was to make, but most importantly, how DELICIOUS. My husband gets nervous when I try new things but he absolutely loved it!